Provide comfort for the family of Florence Schenk with a meaningful gesture of sympathy. 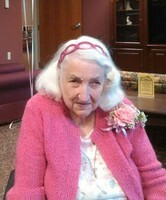 Florence D. Schenk, 93, of East Syracuse, passed away on Friday. She graduated from Minoa High School and retired from Key Bank in 1983 after 50 years of service. Florence was a member of the Minoa First United Methodist Church and was a former member of Eights and Dates Square Dance Club. She was predeceased by her parents Daniel and Caroline Schenk; sisters, Gertrude Roberts, Viola Schenk and Margaret Purdy and her longtime friend and dance partner, Donald Whaley. Survivors: two nieces, Lillian (Dennis) Mack and Beverly (Stanley) Brownell as well as great, great-great and great-great-great nieces and nephews. Services: A calling hour will be from 11 to noon on Monday, March 11 at R. H. Schepp & Son Minoa Chapel, 6530 Schepp’s Corners Road, Minoa. A service will follow at the funeral home at noon. Burial will be at Minoa Methodist Cemetery. The family would like to extend a special thank you to the 3rd floor staff at Elderwood at Birchwood in Liverpool for their exceptional care of Florence. Contributions in her memory can be made to Minoa Methodist Cemetery 250 East Avenue, Minoa, New York 13116.